Mickey Mouse Clubhouse: Minnie's Masquerade! Just in time for Valentines Day! Join in the ultimate masquerade party with Minnie, Mickey and pals in a fun-filled collection of Mickey Mouse Clubhouse latest episodes that celebrate themes of friendship, teamwork, sharing and problem solving. Mickey Mouse Clubhouse: Minnie’s Masquerade is the perfect gift to dress-up your Valentine’s Day, available on Disney DVD February 8 from Walt Disney Studios Home Entertainment. This latest release features four playful Minnie-themed adventures previously seen on the Mickey Mouse Clubhouse TV show, a never-before-seen episode, and a free paper mask with festive embellishments that kids can personalize. And as a special option for consumers, Disney has packaged a version of the DVD to include the exclusive Mickey Mote – a child-friendly handheld remote control, shaped like Mickey ears, that takes children’s viewing experience to a whole new level of play. The DVD + Mickey Mote Play Set is the ultimate value for moms and equally fun and engaging for kids! features include two levels of play, which provides more challenging questions as the child grows. The Mickey Mote can be used with any Disney Preschool DVD that includes the Discovery Mode feature. To date there are more than 11 titles that can be used with the remote control, just take a look at the back of the package to make sure. Is there anything more cheerful than the sound of Mickey and his friends setting off to solve a mystery? !They start with a song, and end with the "Hot Dog"song...just pure FUN! These lovable character's have definitely captured my little one's attention, and I LOVE that they are interacting and learning while watching Mickey Mouse Clubhouse! They really get involved and try to solve the mystery along with the character's. As one of their absolute all time FAVORITE television shows they were super excited to check out Mickey Mouse Clubhouse: Minnie's Masquerade on DVD! 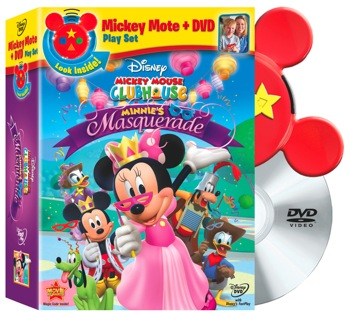 Not only does Mickey Mouse Clubhouse: Minnie's Masquerade come with the wonderful, interactive "Mickey Mote" which allows kids to play along and answer questions with the DVD in Discovery Mode...there were other extras that just added to the fun! The DVD also includes a shiny mask so that the kids can play along with the character's (the princess immediately claimed it! ), and a Color your own DVD Cover so that the kids can customize the DVD Cover! With mask on, crayons out (to color the customizble DVD cover), and the "Mickey Mote" ready..... the kid's were ready to watch! They had a wonderful time watching the never before seen episode, and following along with the Mickey Mote (with the DVD in Discovery Mode). The princess loves dress up, and played along (running to grab her own dress up clothes) as she watched Minnie and her friends get all dressed up and ready for the Masquerade Ball! The kid's really seem to focus and pay attention to what they are watching (more so) with the DVD in discovery mode.....they really enjoyed playing along! We're excited to find additional Disney DVD Title's that offer Discovery Mode™ , the kiddo's are enthralled with the "Mickey Mote"! All about friendship and working together; we all really enjoyed Mickey Mouse Clubhouse: Minnie's Masquerade! It would make the perfect treat for little one's this Valentine's Day! BUY IT: Mickey Mouse Clubhouse: Minnie's Masquerade will be available in stores (and at online retailer's) February 8,2011...... just in time for Valentine's Day!